2 or more only $9.99 each! This themed survival bowie sports a tough 11 in. 3CR13 stainless steel blade with sawback. The handle storage compartment contains a mini survival kit with matches, fishing line and hook, bandage, water tight container, and is capped with a compass. A sharping stone is included within a snap-pouch on the sheath. The blade features Firefighter artwork. 16 in. overall. Tip of knife broke off keeps an edge sheath is good easy to sharpen not very sharp when it arrived serations not sharp over all a good knife. very good, stable, balenced and AWESOME knife!!!! this knife is a steal and its way worth the money!! buy it now! WOW! This bowie knife was significantly bigger than I had imagined. The blade itself is huge and nicely made. The handle is a rubber material that feels good to hold (although it is kind of big). Inside the handle there is a spring that keeps the storage case with survival tools in it from banging around. There is also a compass in the part that unscrews. The case is also very well made and the blade fits securely inside. I love this knife and it's only 15 dollars! This was one of my better purchases on TrueSwords. 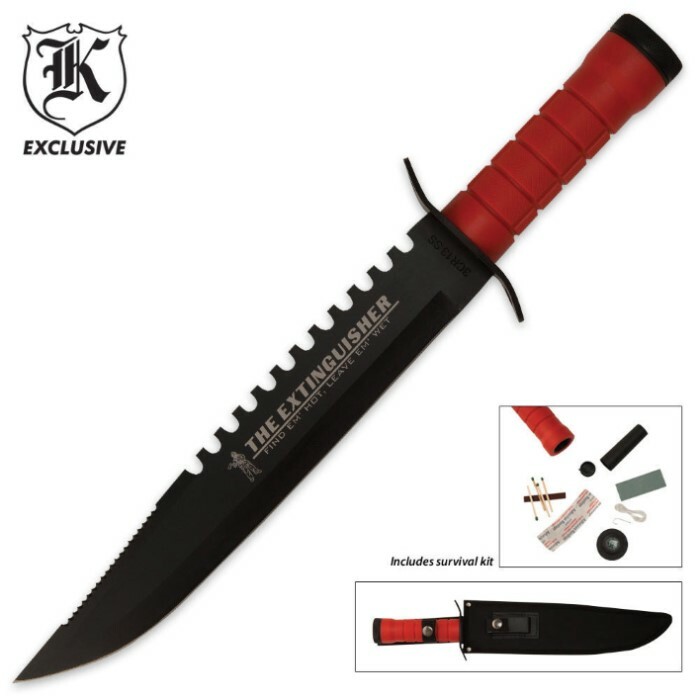 This is the best survival knife i ever seen and it comes in handy some times. Excellent buy, this thing is huge, sturdy and balanced, nice thick sharp blade. Almost the same as "Border Patrol" and "Apocalypse Survivor" only difference are the blade stamps, handle colors and boxes, I bought all three. Under 10$ if you 2 or more and you should! Very nice knife for the money, feels like a good balance, nice thick blade, sharpened at about a 33o angle, would be better if at a 25o but still sharp. Good buy for 9.99.